Deep Neck Flexors- Small exercises for big neck pain. Most people have heard of “the core” when talking about low back pain and strengthening, but not many have heard of the deep neck flexors (DNF) which are a group of muscles that are “the core” for neck. These small muscles are buried deep in your neck and are responsible for the stabilisation of the neck. Most people with neck pain do not experience a complete resolution of symptoms, resulting in a persistent and recurrent condition. Between 50% and 85% of those who experience neck pain at some initial point report having it again 1 to 5 years later. Training of the neck stabilisation muscles has been shown to be crucial in the complete resolution of recurrent and chronic neck pain. It has also been shown to beneficial for athletes in contact sports in the head such as rugby and soccer for prevention of injury. Training the DNF’s requires the participant to lye on their back with the neck supported with a rolled up towel under the head. 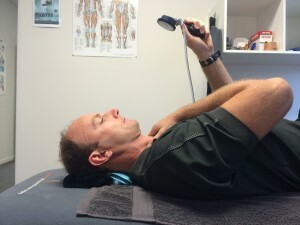 The physiotherapists at Bureta use the pressure biofeedback cuff under the neck to help you train these muscles. To activate the DNF we ask you to perform a small head nod without activating the larger muscles around the neck. We grade the strength of your neck flexors which can be anywhere between 22mmhg and 30mmhg on the pressure cuff. Once you have the correct technique you will be asked to perform the exercises daily and we will review your progress on the next appointment. Depending on your symptoms and what your goal is, we have a progressive strengthening program with specific exercises for the DNF’s to reach their optimum function. You should notice an improvement in symptoms within the first few weeks but it may take up to 12 weeks to build the strength you require depending on your goal. The physiotherapist at Bureta can guide you through the process, contact us for an appointment.